the death of a loved one or the emotional pain associated with divorce or separation. Facing the loss of a house with all your belongings and you can’t think straight. This card brings feelings of isolation and loneliness that may lead to severe depression. It is a time when you cannot see a solution to your problems and lie awake at night. You may be isolating yourself from people or cannot share your problems and worries with others or ask for help. Either, you might be a very proud person, not used to relying on others. Or you may find it is difficult to communicate your needs or feelings. 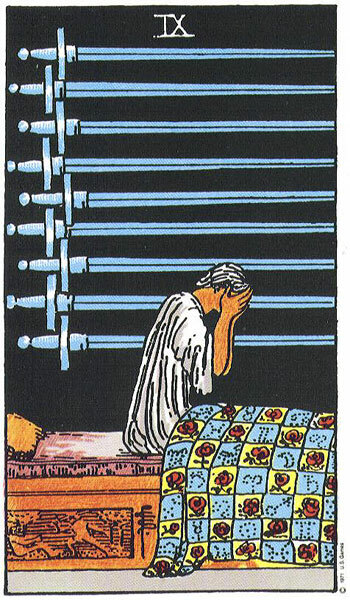 With the Nine of Swords, vivid dreams may be disturbing your sleep. Or, you may literally be suffering from insomnia. The Nine of Swords also deals with female health issues and hormonal imbalances. Since, this is a Nine and therefore the end of a cycle. We may be looking at sleep related problems due to menopause or hormonal imbalance. The Nine of Swords suggests you are working under serious pressure and stress. You may be on the verge of a breakdown and could badly need help. You may feel losing your job! Your Business may be going down the drain. You could overcome with all the worries and problems connected with it. You need to talk to all those involved with your business. You should not take this entire burden on yourself. The Nine of Swords can also suggest you are working night shift and feel exhausted as a result. In general brings no joy or happiness.